Bank stocks were strong on Thursday with a decent weekly jobless claims report. NEW YORK ( TheStreet) -- Bank of America ( BAC was the winner among the largest U.S. financial companies on Thursday, with shares rising over 3% to close at $9.41. The Dow Jones Industrial Average and the S&P 500 ( SPX.X each advanced 1%, while the NASDAQ Composite saw a smaller gain, following a strong showing by Mitt Romney during his first debate with President Obama. The U.S. Labor Department reported that first-time jobless claims for the week ended Sept. 29 totaled a seasonally-adjusted 367,000, increasing from an upwardly revised 363,000 a week earlier. The four-week average for jobless claims was unchanged at 375,000, while continuing claims were also unchanged, at 3.271 million. The KBW Bank Index ( I:BKX rose 2% to close at 51.45, with all 24 index components seeing gains for the session. 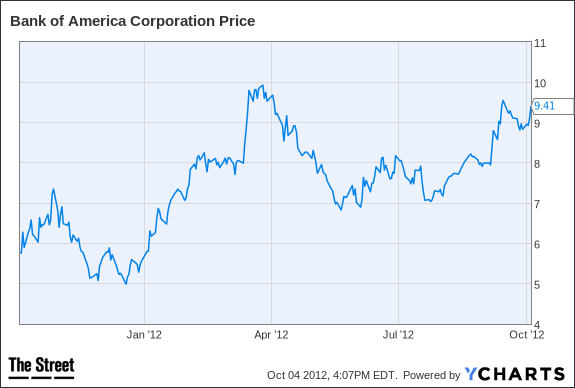 Bank of America's shares have now returned 70% year-to-date, following a 58% decline during 2011. The shares trade for 0.7 times their reported June 30 tangible book value of $13.22, and for 10 times the consensus 2013 earnings estimate of 91 cents share, among analysts polled by Thomson Reuters. The consensus 2012 EPS estimate is 48 cents. The company will report its third-quarter results on Oct. 17, with the consensus among analysts being a small profit of seven cents a share, declining from 19 cents in the second quarter, and 56 cents during the third quarter of 2011. Bank of America on Friday announced it had agreed to pay $2.43 billion to settle a class action suit brought in 2009 by investors against the company and "certain of its officers and directors," over claims that the bank and its executives made misleading statements when the company acquired Merrill Lynch. The settlement has to be approved by Judge Kevin Castel in the United States District Court for the Southern District of New York. In addition to litigation expenses of $1.6 billion, Bank of America said its third-quarter results would be "impacted by approximately $1.9 billion (pretax) in negative fair value option (FVO) adjustments and debit valuation adjustments (DVA) related to the improvement in the company's credit spreads, and the previously reported charge of approximately $800 million to income tax expense for changes in the U.K. corporate tax rate and the related effect on the deferred tax asset valuation." The above items "are expected to negatively impact reported third quarter EPS by approximately $0.28," the company said. KBW analyst David Konrad rates Bank of America "Market Perform," with a $10 price target, saying on Monday as part of his firm's third-quarter earnings preview for universal banks that "2e expect the expense line to be a big piece of the quarter at $17.6 billion, with about $2.6 billion coming from its Legacy Asset Services Division," and that "BAC's cost savings initiatives are just ramping up and we are only expecting $200 million to come in this quarter--but we are hopeful management can help investors walk through how the $17 billion to $18 billion per quarter current expense run rate should be $15 billion to $16 billion in the future." Investors will also expect Brian Moynihan to comment on Bank of America's long-running dispute with Fannie Mae, over the government-sponsored mortgage giant's mortgage repurchase claims against the company. During the second quarter alone, Bank of America's total mortgage putback demands from investors rose 41%, to $22.7 billion, as of June 30. Interested in more on Bank of America? See TheStreet Ratings' report card for this stock.